Posted by sjroby in Book reviews, Space: 1999. Back in 2002, something strange and unexpected happened: a small US publisher produced Resurrection, the first original Space: 1999 novel in over twenty years. In the years since, Powys Media has been responsible for eight more original novels, revised versions of two of the 1970s tie-ins, a revision of the Year Two novelizations by Michael Butterworth in a single big hardcover, a short story anthology, and two nonfiction books about the Powysverse books. A few more books are planned but there’s no guarantee they’ll happen, as the original guiding force behind Powys, Mateo Latosa, stepped down a while back and novelist William Latham has taken over as the force behind the company. He’s already announced that the company is winding down, but he hopes to get the last few books done. I have to admit, I think the line’s been something of a mixed bag. Latosa (and Latham, I assume) planned a continuity for the books that included making some changes to the show’s canon, bridging the gap between Year One and Year Two of the TV series, and moving forward to a resolution for the series. It’s not a bad idea but the resolution, I thought, sometimes left something to be desired. The line premiered with Latham’s novel Resurrection. His only previous novel, a Frankenstein-inspired novel, was the first book published by Powys, and he was reportedly not a Space: 1999 fan before Latosa got him involved. That’s cause for concern, it seems to me, and some of the choices Latosa and Latham made also had me wondering. They launched their line with a sequel to a first season episode, “End of Eternity,” that had the series characters affected by an alien and not being themselves. So they’re starting with a continuity-heavy story based on an episode I didn’t remember (didn’t have it on VHS and hadn’t bought the DVDs yet) and didn’t properly reintroduce the characters because they were essentially possessed. At least, that’s how I remember it. Plus, the book was an expensive mail-order-only proposition, short by modern standards, and with questionable choices like printing the entire text in a sans serif font. And yet, it was a thrill to have the book. I got into Space: 1999 as a 12-year-old back in 1975. I bought the novelizations and other products and, though I thought the core premise was kind of goofy, I loved the show. The next novel solidified my interest in the line. Written by John Kenneth Muir, author of nonfiction books on Space: 1999, Blake’s 7, Doctor Who, and others, it bridged Y1 and Y2, explaining the departures of a few characters in a novel that didn’t feel like a continuity exercise but was instead a strong, suspenseful read. It was followed by another good one, a Victor Bergman-focused novel by Brian Ball, who’d written one of the 1970s novelizations. Then came (in my opinion, at least) a couple of bad decisions. Only three years after Resurrection, with only three novels under their belt, Powys published an expanded version of Resurrection that included an adaptation of “End of Eternity” and a prequel story. Then they produced their Year Two book, a big, overpriced collection of material that their target audience probably all already had. It added an adaptation of a missed episode and made some tweaks that would tie into the Powys continuity, but it never seemed like an essential step. I have it but still haven’t read it, because I read the original books decades ago and I have the DVDs. Around the same time Powys published its single finest work, the novel The Prisoner’s Dilemma by Jon Blum and Rupert Booth, the first of their planned series of Prisoner novels. But that’s a story of its own. Things went quiet for years. Then, in 2010, there was a burst of activity. First, a short story anthology with a mix of familiar names and new writers; then Born for Adversity, the first Year Three novel, by veteran Doctor Who and Star Trek novelist David McIntee (a big positive sign, it seemed at the time; a good book by a bigger name than William Latham, anyway); Latham’s two-part epic Omega and Alpha, an ambitious (too much so, possibly) attempt at pulling together a number of strands from the TV series to explain what Starlog writer David Hutchison dubbed the Mysterious Unknown Force; and, before the end of the year, Latham;s Chasing the Cyclops, a behind-the-scenes nonfiction book about the planning on the Powysverse storyline and Omega and Alpha in particular. All we got in 2011 was a revised version of John Rankine’s 1976 tie-in novel Android Planet. I hadn’t been too impressed with it then and wasn’t much more impressed this time around. 2012 saw Pat Sokol’s The Powysverse Compendium, a guide to the Powys version of Space: 1999 continuity, and a revision of Rankine’s 1976 Phoenix of Megaron, about which I felt much as I did about Android Planet. 2013 saw Latham’s novel Johnny Byrne’s Children of the Gods, based on an unproduced episode. However, the episode wasn’t filmed because it was already a bit of a cliche, and Latham’s changes to freshen it up didn’t really make it that much more interesting. John Kenneth Muir’s second Space: 1999 novel, The Whispering Sea, appeared in 2014, and was a solidly entertaining book, the best since at least Born for Adversity. This year started with a surprising note from Bill Latham on the Powys website: Powys would be winding down the books and its operations, and Latham would oversee the last few books without Latosa. He hoped to produce some books in the pipeline before the end of the year. 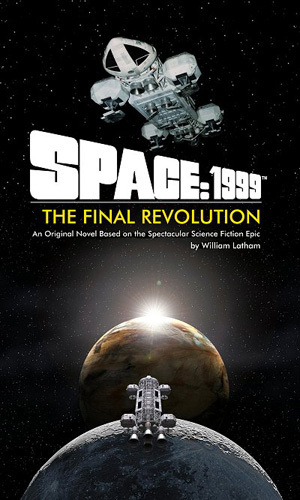 Well, August saw the release of his The Final Revolution, the book that wraps up the Space: 1999 story, building on the short unofficial video Message From Moonbase Alpha. I don’t know if we’ll see the other novel or two or the second planned short story anthology, but at least the continuity has reached its planned ending. The Final Revolution is set a couple of decades after the TV series. The regulars are getting older (including Victor Bergman, who returned to Alpha a few books back), the next generation is growing up, new areas have been built to expand beyond the core of Moonbase Alpha. But then the moon is (literally) pulled into a lunatic alien leader’s genocidal plans and a desperate plan of escape leads to an extradimensional place of mystery. There’s a bit too much philosophizing and some dialogue that suggests Latham read a few books of daily affirmations, but by and large the book is engaging and entertaining, even if some of the new young characters aren’t fully fleshed out. The book also refers back to Omega and Alpha a fair amount, so it’s not all going to make sense to newcomers. But it has a satisfying ending as Project Exodus finally brings the Alphans to a new home — and there’s a surprise near the end that ties into an earlier novel. Not a bad conclusion to a mixed line of books. It’s been a long, strange trip, but after a few periods of cynicism and frustration on my part along the way, I really hope Latham can see his plans through and get another book or two out before winding down Powys, though I assume they’re set earlier in the continuity.